The mobile technology juggernaut is also shaking up its board of directors as part of an agreement with investment company Jana Partners. Jana, which owns a chunk of Qualcomm's stock, has pressured the company to spin off its chip division from its patent licensing business. The realignment was announced as Qualcomm reported its profit fell by nearly half in the April-to-June quarter on revenue that declined by 14 percent from a year earlier. "The changes we are announcing today are designed to enable us to right-size our cost structure and reposition Qualcomm for improved financial and operating performance," CEO Steve Mollenkopf said in a statement. 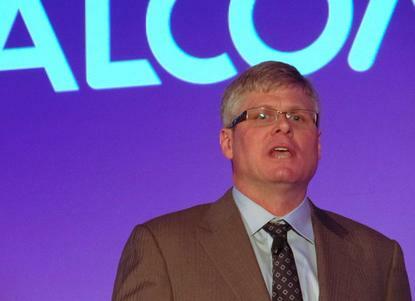 Qualcomm plans to cut $1.1 billion from its annual costs of $7.3 billion. It also intends to cut share-based compensation by $300 million per year. It will cut jobs, close offices and shift more operations to lower cost locations. Palo Alto Networks Chairman and CEO Mark McLaughlin and Tony Vinciquerra, senior advisor to Texas Pacific Group and former CEO of Fox Networks Group, have joined Qualcomm's board as part of the deal with Jana. Together with Jana, Qualcomm will also appoint another board member soon.